Ahbeer. There’s no secret that it pairs nicely with pizza, pretzels, and the Superbowl. But knitting? According to two local craftswomen, the two hobbies couldn’t have more in common. And to prove it, Anne Gough, owner of Yarnsat the Adobe, and Jenne Hiigel, author of a book in progress called A Knitter’s Guide to Beer, are offering classes for enthusiasts of both worlds. “Beer and knitting are both very sensual crafts,” says Hiigel. “With beer you have taste and aroma, with knitting you have tactile and texture.” The two share more in common than that, she says. Both beer and yarn rely on a few quality ingredients to produce diverse results. What’s more, both have rich origins, with brewing historically being done domestically by women, and knitting having roots in the male-dominated fishing, hunting, and luxury garment industries. It wasn’t until both crafts became industrialized and profitable, says Hiigel, that gender roles morphed into the stereotypes they are today. But Hiigel and Gough hope to change that. 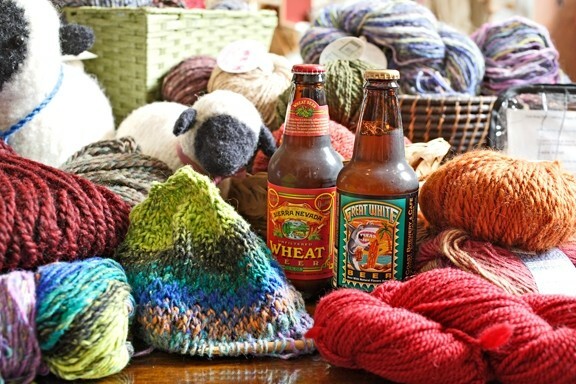 BEER AND YARN : What could be better together? Classes being offered range in topics from American beers and dishcloths, to Christmas beers and knitted ornaments. Hobbyists learn to appreciate the harmonious qualities of each craft, as well as how to match the perfect beer with the perfect knitting project based on mood, culture, or simple sensuality. “Classes are filling up fast,” says Gough, who will be hosting them at her yarn shop. Nestled in the historic atmosphere of the Sauer-Adams Adobe building across from Mission San Luis Obispo de Tolosa, Gough’s shop is one of the few places in the county that specialize in high quality yarn and knitting supplies. Classes started Nov. 8, and convene the second Saturday of each month. Visit Yarnsat the Adobe at 964 Chorro Street in San Luis Obispo or go to www.yarnsattheadobe.com for more information on classes. To connect with beer and knitting enthusiasts near you or to learn about upcoming gatherings, visit www.ravelry.com.